Despite the general scholarly consensus about Lucretius’ debt to Empedocles as the father of the genre of cosmological didactic epic, there is a major disagreement regarding Lucretius’ applause for his Presocratic predecessor’s praeclara reperta (DRN 1.732). In the present study, Garani suggests that by praising Empedocles’ discoveries, Lucretius points to his predecessor’s epistemological methods of inquiry concerning the unseen, methods upon which he himself draws extensively and creatively enhances. In this way, he successfully penetrates into the invisible natural world, deciphers its secrets, and thus liberates his pupil from superstitious fears about death and physical phenomena. 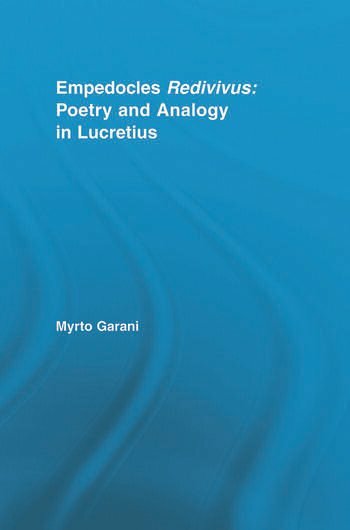 To justify this proposition, Garani undertakes a systematic analysis of Lucretius’ integration of Empedocles’ methods of creating analogies in the form of literary devices -- personifications, similes, and metaphors -- and demonstrates that his intertextual engagement with Empedocles’ philosophical poem is direct and intensive at both the poetic and the philosophical levels.